I got this great idea once again from Pinterest! Can’t find the original card…but I know I saw it long ago! What did we do before this tremendous site??? What a great gift! Don’t you think? CAS on Sunday Girls and I !! Here is a link to our blog to get you started! Just remember to keep it CLEAN and SIMPLE! and the sentiment is also SU. The rest is scraps of this and that! Categories: Cards, challenges | Tags: baby card, Card making, Cards, rubber stamps, stamping, Stamping Up, Verve Stamps | Permalink. This is adorable. Love how you created the cute little wagon. Lovely card, such sweet colors! I am “LOL-ing” all the way to the craftroom, THIS is perfect! SUCH an outstanding way to welcome a darling lil’ one… New parents will NEVER forget your talent and thoughtfulness…. Well done! 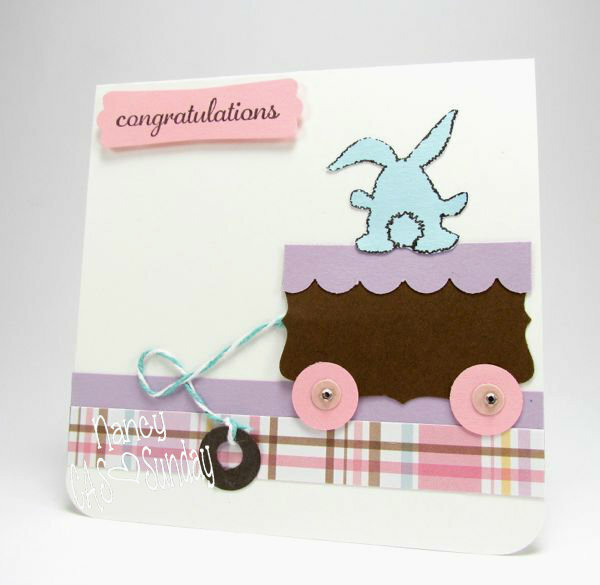 Love this little wagon and the cute bunny!